Translation of genetic information into protein is fundamental to life. 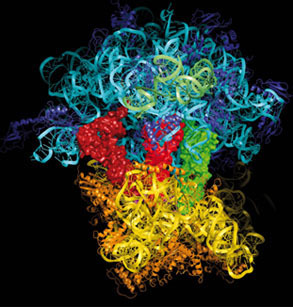 It is carried out by the large macromolecular machine called the ribosome. In 2000, we solved the structure of the 30S ribosomal subunit and its complex with several antibiotics as well as its mRNA and tRNA ligands. Since then, we have solved the high-resolution structures of the entire ribosome at several points along the translation pathway, leading to insights into decoding, translocation and termination. We are currently interested in translational initiation in both bacteria and eukaryotes, as well as how certain viral sequences disrupt the process in eukaryotes. The control or deregulation of translational initiation in eukaryotes has been implicated in phenomena as disparate as cancer, memory and viral infection, and involves about a dozen initiation factors that bind to the small subunit of the ribosome at various stages, allowing it to scan along mRNA and eventually associate with the large subunit. We are also interested in termination in eukaryotes, and in quality control in translation. Although we have mainly used x-ray crystallography in the past, we are now mainly using high-resolution electron microscopy. Translational termination without a stop codon. Structure of the yeast mitochondrial large ribosomal subunit.